It all begins with a good primer, or two. I’m a big believer in the power of the primer – it means you can use less foundation, and really work towards treating any skin concerns. My absolute favourite for dehydrated complexions is the Too Faced hangover primer – this stuff plumps up skin a treat. I like to liberally massage this in all over my face, and then go in with the Hourglass Ambient lighting primer just on my cheeks (full post on that here). If that wasn’t enough, I finish it off with a little yellow colour correcting from MAC. If I have any blemishes, which sadly I often do, I conceal them prior to foundation using the Make up Forever full cover concealer. This stuff is insane. So pigmented, and covers anything. Lasts ages too. I like to apply concealer before foundation because then I use less foundation – no point covering everything up and then covering it up some more. For this I normally use the RT buffing brush. 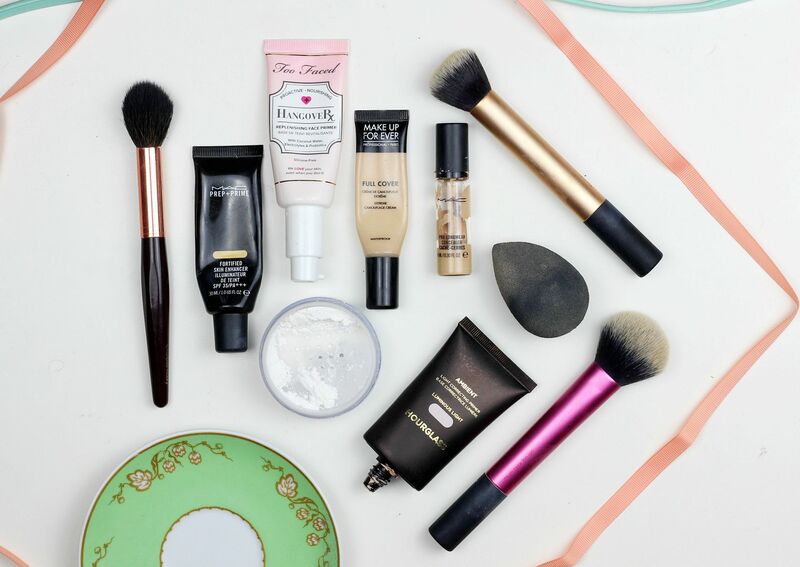 For actual foundation – this changes on a daily basis. At the moment, enjoying Becca, Charlotte Tilbs and NARS. Whatever I use, I use a damp beauty blender. Then after that, I use way too much MAC pro longwear concealer (in NW15) under the eyes. I like the finish, and the fact it doesn’t budge/need to be set. Lastly, I dust everything into place using the By Terry hyaluronic powder. Dreamy stuff, it blurs the skin and gives a soft focus.